It seems that soon we could have another version of Windows 10, one that seems to be a light installation and that unlike what they tried to do with Windows 10 S , does not limit the user to the applications of the Microsoft store, but rather it eliminates several of those that already come by defect with the system. Windows 10 Lean was found as an installation option in the latest draft version of Windows 10, build 17650 of Redstone 5, the second major update of the system that we expect for 2018. The discovery was made by the Twitter user, Lucan , who posted several images on his profile. 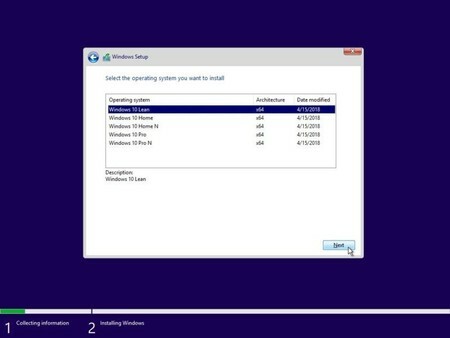 Windows 10 Lean is a clean installation x64 and that is about 2 GB smaller than Windows 10 Pro . Lucan indicates that by default there is no desktop background, the Windows 10 S restrictions do not apply since you can use the command console and reg.exe without problems. Nevertheless, there is no “regedit” (the registry editor) . The list of programs that are not included in Windows 10 Lean is quite long, going through the mythical Internet Explorer, the old Windows Media Player and Windows Power Shell, to things like Paint and Solitaire, to several of the modern Windows 10 apps, like the application of Mail, Photos, Weather, Office hub, Contacts, Skype, Maps, Xbox, Movies and TV, etc. In the images you can see how the start menu has the most tiles without applications. Unlike with Windows 10 S, the user can download from the store or install classic Win32 apps. How “light” end up being this version of Windows 10 in the future and if they will go beyond removing some applications to reduce the installation size a little more than those 2 GB, is something that we will have to wait for.